The DIACALYMENE trilobite comes from Morocco. These trilobites are found in nodules and require the rock to split to obtain the fossil. Due to the breaking of the rock, frequently the trilobite will break are require minor reassembly. 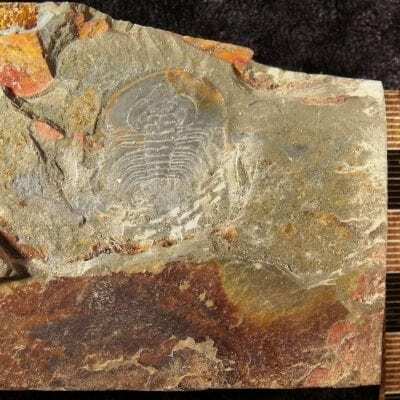 This DIACALYMENE measures 3.36 inches in length and you will receive this trilobite pictured. The example below is what a nodule looks like open, EXAMPLE NODULE IS NOT THE TRILOBITE YOU WILL GET, for education only. Pair of RHIPIDOMELLA Brachiopods from two different States !